“Yes they are, like a little baby! Baby Steph. I can’t believe my arms used to be as small as yours,” my sister Nan said as we looked in the mirror. Most women don’t react with such enthusiasm when comparing bicep girths, but then again most women aren’t firefighters. Since Nan first started training she has gained some serious muscle. We hadn’t seen each other in two years, so she was excited to remember where she had started- the same muscle tone as me. 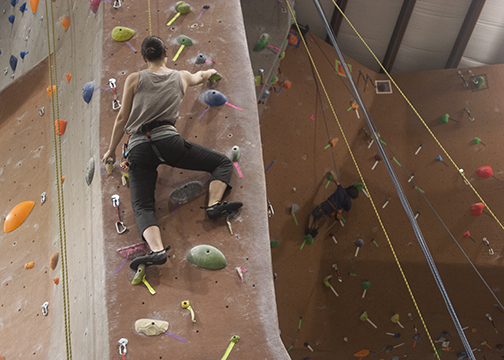 Nan had also recently started a new part-time job at a rock climbing gym and she wanted to show me the ropes. Since I didn’t want to look like the only bumbling idiot, I decided to take my brother. Like our sister, Kyle works out but I would say his muscles were less functional. More like trophy muscles. 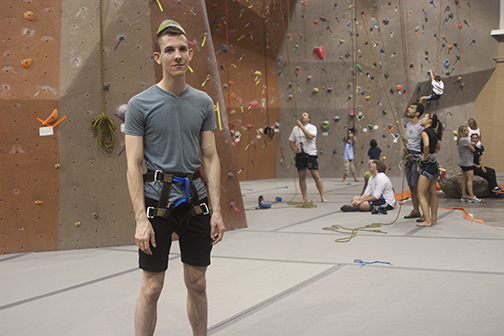 I had never done any rock climbing, so I didn’t want to go first. Kyle didn’t like looking stupid, so he didn’t want to go first either. 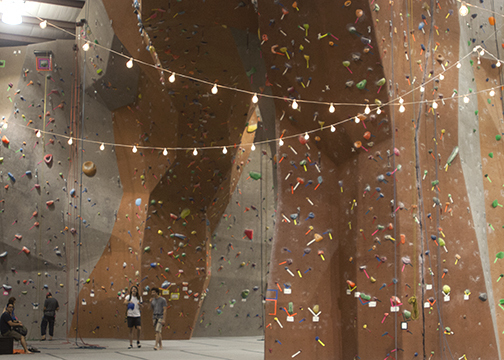 It was only after we saw little kids scale the bouldering wall like spiders that we decided to give it a go. He and I tried all the same routes and after a few runs Kyle’s toe started ‘hurting.’ So we sat and waited for Nan to help us use the harnesses and climb the big walls. “You go first, show me your skills,” I taunted my brother. “Steph, stop it. My toe is still hurting,” Kyle replied as he gingerly cupped his foot. “I’ll take photos of you climbing,” my brother finally offered. I felt confident as I began the climb (No, the above photo is not me). My route was the lowest difficulty level so all the hand holds were pronounced and evenly spaced all the way up. I shouldn’t have looked down though. I was just at the halfway point when I realized how far away the ground was. It didn’t seem very comforting that only a thin rope, anchored to a wedgie-inducing harness, could save me from catastrophe. As I neared the top my pace slowed and my legs became more wobbly. When at last my hands touched the final stone my sister yelled out her next instructions. I took one foot off, but none of my other appendages followed. It felt so counter-intuitive to release my firm grasp, but I convinced myself to trust my sister. It was at that moment, when I didn’t plummet to the ground, that I felt grateful for Nan having stronger arms than me. Super and well written article! One of your best!